You have a super power. You can make someone's day. You know those projects that make you feel as if you’re spinning your wheels and you’re going to lose whatever hair you have left? Cheryl Rice was working on one of those projects. She was frustrated. She felt stalled. She was dejected. Then a colleague gave her a card that changed everything. Often when we’re going through a rough time, we feel alone, and just having someone notice and understand makes all the difference between feeling invisible and feeling loved and supported. For Cheryl, that card bearing just two little words is what made her realize she wasn’t alone. Cheryl was so touched by the gesture that she ordered 100 of her own cards to give away, first to family and friends and then to acquaintances. Eventually, she also started leaving cards in strategic locations to brighten strangers’ days—in the credit card holders at gas pumps, in library books, on car windshields. I was standing in the checkout line behind a woman who looked to be in her sixties. When the cashier asked her how she was doing, the woman said, “Not so good. My husband just lost his job and my son is acting out. The truth is, I don’t know how I’m going to get through the holidays.” Then she gave the cashier food stamps. My heart ached. I wanted to help but didn’t know how. Should I offer to pay for her groceries? Ask for her husband’s résumé? I did nothing, and the woman left the store. As I walked into the parking lot, I spotted her returning her shopping cart and remembered something in my purse that might help her. My heart pounded as I approached her. “Excuse me,” I said. “I overheard what you said to the cashier. It sounds like you’re going through a really hard time. I’d like to give you something.” And I handed her a “You Matter” card. When she read it, she began to cry. “You have no idea how much this means to me,” she said through her tears, and we hugged. I hadn’t anticipated her reaction, and when I walked back to my car, I cried, too. For Cheryl, the experience was so powerful that she needed to share it. 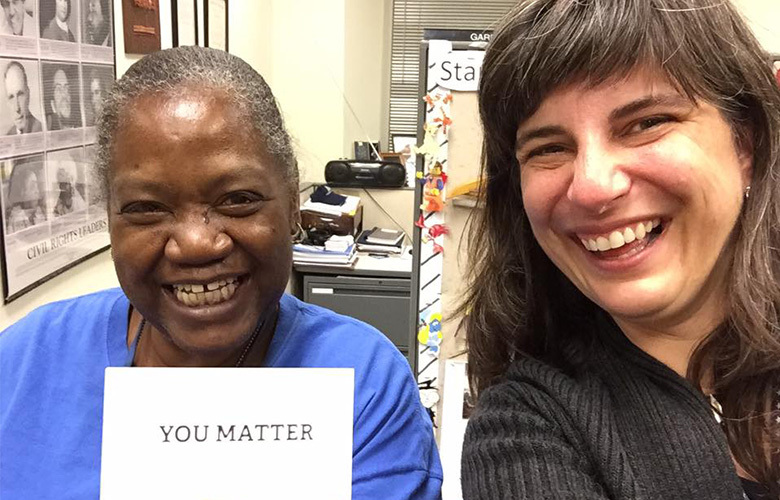 For her final project in her applied psychology certificate program last year, she decided to ship sets of thirty “You Matter” cards free to anyone who signed up online as long as the person committed to giving the cards away. Her plan was to give away 10,000 cards, which would require the participation of 334 people. She called it the “You Matter Marathon” and suggested that participants give out a card a day in November. Well, the idea was more successful than she’d expected. She’d thought her target was a stretch but wound up surpassing the 334 mark in under a month. And because she hadn’t been financially prepared to give that many cards away for free, she and her husband found themselves in a bind. But Cheryl felt strongly that there should be no costs or other strings attached—that the givers begin by receiving their own gift in the form of the cards. Ultimately, her father stepped forward to help with the burden, and she forged ahead with her project. When I gave my grown son a “You Matter” card, he was fighting to hold back tears. He simply held it and looked at it for about a minute. There was a change in his body language, and I got a sense that he finally believes that he does matter in my life and is loved. We were finally able to have a meaningful conversation. The reason it made such a difference in both our lives is because of his past. He suffered from depression for many, many years and kept it well hidden. He had two suicide attempts. I see him every few weeks and we have been trying to mend our relationship. It has been a long process. But there has been a shift in our relationship since giving him the “You Matter” card. He has always been a very quiet, shy person who has difficulty sharing his thoughts. Now he is opening up more … The “You Matter” card was the link I needed to reach him. Having the “You Matter” cards ready to hand out has caused me to look at people differently. It is hard for me to approach strangers, so this is an opportunity for growth. I try to find people with whom I can have a meaningful interaction. Consequently, I am really looking at people … This is making me a much more connected human. Cheryl says many are initially hesitant about telling others that they matter, and people coach and encourage one another on the You Matter Marathon’s Facebook page. But once people get started, there seems to be no stopping them. As part of the marathon, more than 14,000 people gave away 431,460 cards. Now Cheryl is gearing up for the second You Matter Marathon, to be held in November. This time she’s found generous sponsors to cover a portion of the cost of the cards and shipping. There’s no advertising or even a web address on the cards, because she wants it to be only about acknowledging someone. All this good actually began with Vicky O’Grady, a therapist based in Florida who also gives out “You Matter” cards. She happened to be distributing them at a conference that a certain colleague of Cheryl’s attended last year, and one of the cards found its way to Cheryl when she needed it most. The rest is history. To request your own “You Matter,” cards, click here.